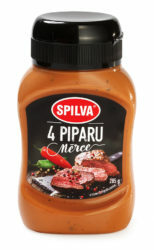 Spilva’s “Four-pepper sauce” is rich in mild peppery flavor, truly appreciated by all seasoning experts and gourmets. The unique flavor of the sauce comes from chili, black, green and Cayenne peppers combined with honey, lemon juice concentrate, canola oil, wine vinegar, tomato puree, and other ingredients. The sauce compliments Italian and Asian dishes, chicken dishes, as well as other meat dishes and snacks. Sauce available in 295 ml plastic bottles. Shelf life – 12 months. Store the product in the refrigerator after opening. 100 g contains: energy value – 405 kcal (1,690 kJ); 9.8 g protein; 29 g carbohydrates (of which – 28 g sugars); 27 g fat (of which – 2.2 g saturated fatty acids); 2.4 g salt.